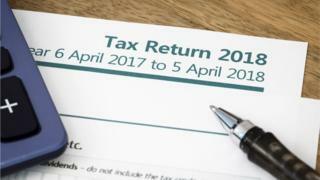 Taxpayers who missed January's self-assessment deadline might see increased fines because of a delay in sending out penalty notices, experts have warned. From 1 May the standard £100 fine rises by £10 a day - so when letters arrive, penalties could already be accruing. HMRC blamed increased workload from Brexit for the delay but said no one would be "unfairly penalised". In a notice issued on Friday, HMRC said: "We expect an increased demand in our call centres as the UK leaves the EU, so we intend to delay the issue of these notices to ensure we can provide the best service to our customers. "This will release those staff for EU exit related work. "We will issue daily penalties to individuals who have still not filed three months after the deadline, in appropriate cases, at the normal time." Jon Stride, of the Association of Taxation Technicians, said: "If the £100 penalty notice is issued by HMRC at the end of April, a taxpayer may, by the time the notice hits their doormat, already be incurring additional penalties." And Dan Neidle, a tax lawyer at Clifford Chance, told the BBC: "Where people have genuinely forgotten, it seems harsh and even unfair to remind them so late that they're already running up daily penalties." An HMRC spokesman said: "No-one will be unfairly penalised as a result of this change. The vast majority will be aware they missed the January 31 filing date, as we do remind regularly with nudge messages before the deadline. "The latest date letters will go out is April and this will still leave customers several weeks to contact us. This is sensible planning to make sure we focus our resources on delivering important functions in the event of a no deal [Brexit]."